Russ Feingold has announced plans to attempt to win back the Senate seat he lost six years ago in the video above. “People tell me all the time that our politics and Washington are broken. And that multi-millionaires, billionaires and big corporations are calling the shots,” Feingold says in the video. “They especially say this about the U.S. Senate, and it’s hard not to agree. But what are we going to do? Get rid of the Senate? While Feingold is seen as a very strong candidate with perhaps better than even odds to pick up the seat he lost to Ron Johnson during the 2010 Republican tsunami, his return to the chamber would certainly be a rarity in the modern political era. Smart Politics first reported in February that only two U.S. Senators have returned to the chamber after losing their seat at the ballot box since 1956. Feingold’s return to the Senate is very important for those of us who vote Democratic based upon issues such as civil liberties, opposition to unnecessary wars, campaign finance reform, and transparency in government. If Hillary Clinton should win the Democratic nomination as most expect, this would leave us with a choice of both a Democrat and most likely also a Republican who is very conservative on all of these issues. (The lone exception on these issues might be Ron Paul, but he has been flip-flopping to sound like a more conventional Republican). Russ Feingold has battled with Clinton in the past, and he will hopefully be a strong voice in the Senate for liberalism as opposed to Clintonian conservatism. Feingold would also make a far better presidential candidate than Clinton, but it is understandable he would concentrate on winning back his Senate seat as opposed to an uphill battle for the presidential nomination. Nonpartisan advocates of limiting money in politics say the problem is, in no small measure, one of the Clintons’ own making. “It would be in everyone’s best interest if the Clinton Foundation adopted a policy of accepting no money whatsoever from any foreign countries, foreign corporations and foreign individuals,” said Fred Wertheimer, a veteran of the fights over campaign finance who is now president of the watchdog group Democracy 21. The controversies of the 1990s paved the way for passage of the Bipartisan Campaign Reform Act of 2002 — also known as the ­McCain-Feingold Act for its sponsors, Sen. John McCain (R-Ariz.) and then-Sen. Russell Feingold (D-Wis.). A key feature of the law was a ban on the unregulated “soft money” that the Clinton White House had been so adept at raising with its many overtures to deep-pocketed donors. She proceeded to clash with Russell Feingold over campaign finance reform. In light of the recent revelations, several non-partisan watchdog organizations, including some mentioned in Tumulty’s article, are questioning the ethics of the actions by Bill and Hillary Clinton. Common Cause has called for an independent audit of contributions to the Clinton Foundation. The Clinton Foundation made insufficient responses recently and their excuses for failing to disclose some of the contributions have failed to hold up. The Washington Post Fact Checker gave Three Pinocchios for one recent misleading excuse. 1. Deny: Salient questions are dodged, and evidence goes missing. The stone wall is built. 2. Deflect: Blame is shifted, usually to Republicans and the media. 3. Demean: People who question or criticize the Clintons get tarred as right-wing extremists, hacks, nuts, or sluts. This is essentially the same as what David Corn described in Mother Jones last month. Clinton supporters have concentrated on trying to make it appear that they are dealing with attacks from the right. In reality, Clinton does not currently have a Fox problem as much as she has a problem with The New York Times, Reuters, AP, The Guardian, media Fact Checker sites, and some liberal magazines. They have concentrated on claiming to debunk Peter Schwitzer’s book Clinton Cash by screaming that there is no smoking gun in the book. The reality is that Schwitzer’s book is only a small part of the evidence against Clinton, with other reports doing more to demonstrate her guilt than Schwitzer, who never claimed to prove the case in his book. Clinton supporters felt so threatened by the fact that Schwitzer has also been working a similar book on Jeb Bush, diminishing their claims of a right wing attack, that they have been repeating a false claim from a pro-Clinton blog that he is not writing the book on Bush. Their “evidence” consists of a statement that the conservative publisher of Clinton Cash is not publishing the book on Bush, but Schwitzer had said he is seeking a different publisher for that book. While failing to respond to the real questions, Clinton supporters also demand deflect from the facts in demanding that a quid pro quo be demonstrated, but such evidence is rarely preserved in such cases. Nor is it considered necessary for proof, at least when people other than the Clintons are involved. The standards in such a case are that the Clintons failed to abide by the regulations. That is the key fact, but beyond this there is demonstrated transfers of unusual amounts of money, both in the form of contributions to the Foundation and unprecedented speaking fees paid to Bill. This was followed by those who made the payments receiving favors, sometimes including changes in position on the part of Hillary Clinton. Analogous cases in matters such as insider trading are based upon establishing such violations of rules and in patterns of the transfer of money, not in proving a quid pro quo. On top of this, by her own admission, Hillary Clinton has destroyed evidence. She admits to wiping the server. The usual standard in a criminal case would be to assume that any evidence which has been destroyed would be detrimental to the person who destroyed the evidence. This should certainly be sufficient to raise serious doubts in a matter of ethics as opposed to criminal prosecution. Was there a quid pro quo? Based on the Times reporting, there was certainly a lot of quid (millions in donations that made it to a Clinton charity; a half-million-dollar speaker’s fee) and multiple quos (American diplomatic intervention with the Russians; approvals when the Russian firm offered a very “generous” price for Uranium One). The Clinton perspective is that, although the approvals were delivered by the State Department when Clinton led it, there is no evidence that she personally delivered them, or of the “pro” in the equation. The Clinton campaign, in its response to the Times, noted that other agencies also had a voice in the approval process, and gave the Times a statement from someone on the approvals committee saying that Clinton hadn’t “intervened.” The Clinton spokesman wouldn’t comment on whether Clinton was briefed about the matter. She was cc’d on a cable that mentioned the request for diplomatic help, but if there is a note in which she follows up with a directive—an e-mail, say—the Times doesn’t seem to have it. That led a discussion of the failure to meet disclosure requirements, and then three further difficult questions for the Clintons. The size and scope of the symbiotic relationship between the Clintons and their donors is striking. 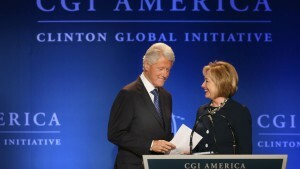 At least 181 companies, individuals, and foreign governments that have given to the Clinton Foundation also lobbied the State Department when Hillary Clinton ran the place, according to a Vox analysis of foundation records and federal lobbying disclosures. Ultimately, it is impossible to tell where one end of the two-headed Clinton political and philanthropic operation ends and where the other begins. The “trust us” model is insufficient for the public. It’s also an ongoing political liability for Hillary Clinton. Both she and the public would benefit from greater controls. She’s not the first politician forced to defend contributions to her charity. Tom DeLay, the legendary former House majority leader and whip, was hammered by the left for taking donations for his children’s charity from corporations and lobbyists with business before Congress. On one level, there’s little difference between special interests donating money to politicians’ campaigns and donating to their charities. The nature of the objections raised by the Clintons taking money from interested parties also applies to their solicitation of contributions to her presidential campaign — and to similar asks made by every other politician. On another level, though, a politician’s charity is a special avenue of access. Politicians’ charities are an attractive place for special interests to funnel money. They can give much larger sums to charities than they can in hard campaign dollars. Because the charities are, by definition, nonpartisan, the contributions look less political. The politician who runs the charity usually has a pretty strong emotional tie to its sustainability and often benefits from payment in the form of travel and accommodations in conjunction with the charity’s activities. Last but not least, donations to the charity are tax-deductible, in contrast to campaign contributions. Candidates for office should seek to set the bar for their own conduct higher than the level required by current law. More important, at a time when the American public has rightly lost confidence that politicians serve the public first, foremost, and exclusively, Hillary Clinton has fallen short of that standard. The question for the Democratic Party is whether Clinton is going to be as strong in the visible primary — and the visible election — as she is in the invisible one. The skills necessary to win over Democratic Party elites may not be the skills necessary to win the election — and if Hillary doesn’t face serious opposition in the visible primary, Democrats may not find that out until too late. Bernie Sanders would also go after Clinton from the left on economic matters but he is sounding less enthusiastic about running. While Clinton definitely deserves to be challenged from the left on economic matters, I do wish there was a comparable potential challenger on the civil liberties and social issues which I’m more interested in. Ron Wyden’s name sometimes comes up in wish lists of Democratic candidates, and he would be high on my list. Any consideration of Democrats who have been strong on civil liberties issues will naturally turn to Russ Feingold. He is is leaving his current job as a special envoy to the Great Lakes Region of Africa and there has been a lot of speculation that he is planning to run for the Senate in 2016. If Clinton should self-destruct, I wonder if he would aim higher. Far too few people who don’t follow politics closely do not realize how extreme the Republicans are, and the degree to which their actions are contrary to American interests. Can this be the issue which opens more eyes? Despite how unethical Clinton’s behavior has been, both with the use of her private email server and her dishonest response, I doubt that this will have any significant impact on the election results. The political meaning isn’t that people will turn against Clinton because of this, but that it shows Clinton’s ability to self-destruct as more controversies come up during the campaign. I did receive a link to one poll which claims, “Majority of Americans believe email controversy will hurt Clinton’s 2016 ambitions.” Being skeptical I checked into Vox Populi, which conducted the poll. It turns out to be a Republican outfit, with Mary Cheney a partner. 51% of voters in the state have a favorable opinion of Feingold to 38% with an unfavorable one. He’s on positive ground with independents at 50/37 and almost twice as many Republicans (15%) like him as Democrats (8%) dislike him. These numbers are a pretty clear indication that his loss last year had less to do with him than it did with the national political climate and poor Democratic turnout in the state. Things are moving back toward the Democrats nationally and that’s particularly the case in Wisconsin where Scott Walker has quickly become quite unpopular. In hypothetical contests Feingold leads Tommy Thompson 52-42, Mark Neumann 53-41, JB Van Hollen 53-38, and Jeff Fitzgerald 54-39. He wins independents by at least 9 points in all of the match ups and takes more than 90% of the Democratic vote while keeping the Republican candidates in the 80s within their own parties. Glenn Beck’s ratings at Fox News continued their steady decline, falling to an all-time low last month. He has lost 39 percent of his viewers in a year and 48 percent of the prime 25-to-54 age demographic. His strenuous recent efforts to portray the Egyptian revolution as an apocalyptic leftist-jihadist conspiracy have inspired more laughs than adherents. Sarah Palin’s tailspin is also pronounced. It can be seen in polls, certainly: the ABC News-Washington Post survey found that 30 percent of Americans approved of her response to the Tucson massacre and 46 percent did not. (Obama’s numbers in the same poll were 78 percent favorable, 12 percent negative.) But equally telling was the fate of a Palin speech scheduled for May at a so-called Patriots & Warriors Gala in Glendale, Colo.
Tickets to see Palin, announced at $185 on Jan. 16, eight days after Tucson, were slashed to half-price in early February. Then the speech was canceled altogether, with the organizers blaming “safety concerns resulting from an onslaught of negative feedback.” But when The Denver Post sought out the Glendale police chief, he reported there had been no threats or other causes for alarm. The real “negative feedback” may have been anemic ticket sales, particularly if they were to cover Palin’s standard $100,000 fee. …in the view of officials from both major political parties, Republicans may be risking the same kind of electoral backlash Democrats suffered after they were perceived as overreaching. Public surveys suggest that most voters do not share the Republicans’ fervor for the deep cuts adopted by the House, or for drastically slashing the power of public-sector unions. And independent voters have historically been averse to displays of political partisanship that have been played out over the last week. Mr. McKinnon said that although Mr. Obama had claimed a mandate after his election, it turned out to be exaggerated, The president had paid a price for it, he said, and was adjusting. Russ Feingold, the Democratic senator from Wisconsin who was turned out of office in the Republican sweep last year, said the new crop of Republicans was drawing false conclusions from the party’s victory. What we are really seeing here is a failure for both extremes. When the Democrats took control of the White House and Congress I recall writing a post warning that the Democrats would again become a minority party if they were to overreach. Looking back at the 2010 election, this should be updated to add the Democrats were also at risk of losing if the Republicans could create a false perception of Democratic overreach. I am glad to see that the article describes the problem of as “Democrats suffered after they were perceived as overreaching” as opposed to actual overreaching. The Democrats took a centrist course but failed miserably in explaining their actions, once again allowing the Republicans to define them and create a false perception of a move to the far left and overreaching. In addition, Obama did make one serious mistake in reversing his campaign position against the individual mandate. This allowed Republicans (who initially supported the mandate) to oppose health care reform as something being imposed upon Americans by big government as opposed to a case of government stepping in to provide help to those who need it when the market has failed. Frank Rich is right that those on the far right are losing because, fortunately, many conservatives out in the real world don’t support the extremism and know-nothing philosophy of Glenn Beck, Sarah Palin, and the Tea Party. Many on the left are also making a mistake when they see any support by Barack Obama or other Democrats for fiscal responsibility as giving in to right wing frames and a victory for the Tea Party. Cutting the deficit is important in the long run. Republicans were wrong during the Bush years when they argued that deficits don’t matter, and exploded the deficit by fighting two wars off the books while cutting taxes primarily for the ultra-wealthy. It is far better to point out how Republican policies are responsible for the deficit than to shy away from any discussion of cutting the deficit. Rather than avoid the discussion, Democrats must point out that some deficit spending is beneficial, such as Obama’s stimulus which kept us out of a depression. Democrats must also continue to point out how cutting taxes for the ultra-wealthy and spending on Bush’s wars has done far more to increase the deficit than Democratic spending. Some on the left want to avoid any use of “conservative frames,” but in doing so they actually hurt the left. When they refuse to mention anything discussed by conservatives, they allow conservatives to take credit for positions they do not actually promote. As a result we have conservatives claiming to be champions of freedom and capitalism, despite the reality that they really support more government intrusion in the lives of individuals and confuse plutocracy for capitalism. This mistaken view that the left must avoid any conservative frames leads to many of the attacks on Barack Obama from the left. Obama, while certainly not always perfect, at least understands that the way to win a majority is to demonstrate to rational conservatives that the economic policies they desire can better be delivered by his administration than by the extreme right. Those who oppose Obama’s attempts to appeal to conservatives argue that this has not led to any support from Congressional Republicans. This is correct but misses the point. The real target is not Congressional Republicans, who care more about denying Democrats any victories for political reasons than they care about any specific issues, or the good of the country. The target is the more rational voters who might have voted Republican in many of the recent elections but who are not totally brainwashed by the right wing noise machine. Attracting these voters, along with independents, explains why Obama’s popularity has consistently been higher than that of Congress, and is now moving upward. It might also explain why some are turning off Glenn Beck. Sen. Russ Feingold (D-Wis.) on Tuesday released a report card-style review of the Obama administration’s progress in overturning President Bush’s controversial national security measures, giving President Obama high marks for most actions except for a “troubling” use of secrecy. Feingold, a member of the Intelligence Committee and chairman of the Judiciary Committee’s subcommittee on the Constitution, gave the highest marks for Obama’s renunciation of Bush-era practices such as harsh interrogation techniques and resistance to Freedom of Information Act requests. Those practices all received “A” grades. “The difference between this administration and the Bush administration is night and day,” Feingold said in a morning conference call with reporters. Feingold said the administration is using the assertion in an “over-broad” manner, and called for the president to support legislation that would allow judges to review state secrets in a secure, closed process. Ultimately if there is no evidence of a crime the devices are returned and copies of the material will be destroyed but written reports may be maintained. The report does state that, “When officers determine there is probable cause of unlawful activity-based on a review of information in documents or electronic devices encountered at the border or on other facts and circumstances-they may seize and retain the originals andlor copies of relevant documents or devices, as authorized by law.” Does this mean that if there is a copy of an illegally downloaded song on an iPod or computer they may retain the device? Senator Russ Feingold has been holding hearings on this policy and is introducing legislation to “require reasonable suspicion for border searches, as well as prohibit profiling on race, religion or national origin.” A pdf copy of the policy is available here. This is a deeply flawed bill, which does nothing more than offer retroactive immunity by another name. We strongly urge our colleagues to reject this so-called ‘compromise’ legislation and oppose any efforts to consider this bill in its current form. We will oppose efforts to end debate on this bill as long as it provides retroactive immunity for the telecommunications companies that may have participated in the President’s warrantless wiretapping program, and as long as it fails to protect the privacy of law-abiding Americans. “If the Senate does proceed to this legislation, our immediate response will be to offer an amendment that strips the retroactive immunity provision out of the bill. We hope our colleagues will join us in supporting Americans’ civil liberties by opposing retroactive immunity and rejecting this so-called ‘compromise’ legislation. While I support both their plans to filibuster and their opposition to retroactive immunity, I will mention once again that I am far more concerned about the provisions which provide for insufficient protections of civil liberties in the future than I am about what happened in the past. I hope that drawing the line on retroactive immunity we don’t wind up winning on this while giving everything else away. If faced with the choice of a good FISA bill which adequately protects civil liberties in the future but which also contains retroactive immunity or the current bill minus the retroactive immunity, I’d go with the first choice. Maybe enough Democrats will stick together, being in the majority after all, to prevent both negative aspects of the bill from being passed. I sure wouldn’t mind seeing the telecommunications companies lose out on what appears to have been an effort to buy votes. With regards to Democrats sticking together, this means you, Barack. The Senate is a deliberative body. Should, as a consequence of hearing such deliberations, you change your mind, I certainly will not think any less of you. Changing one’s mind when they have made a mistake is only a sin to the small minded people on the far right who are obsessed with flip-flops. Sure, I’ll vote for Obama regardless of what he does on this bill, knowing that the alternative is far worse, but I would sure respect him more if he stood firm on this civil liberties issue. I’m sure he is looking at the political ramifications, but with a second poll now showing a double digit lead, he can afford to stand up for principle. As long as the Democrats act as if they are afraid of being labeled as being soft on terrorism, the Republicans will be able to use this against them. Ultimately the Democrats need to stand up for liberal principles, and this is the year in which voters appear to be most receptive to listening. By going along with this compromise, the Democrats are allowing the Republican line to go unchallenged, perpetuating the illusion that the Republican approach is effective in defending the country when they are actually both undermining civil liberties and pursuing policies which are not necessary for our national security. Ultimately the only way the Democrats can end their problem of being portrayed as being weaker on national security is to face the Republicans head on and make respect for civil liberties a bigger part of the pubic discussion. Our nation faces a daunting number of critical challenges: reasserting America’s leadership in the world, meeting our needs for energy independence, addressing global warming, making healthcare accessible and affordable, positioning our economy to effectively compete globally, and extricating ourselves from the war in Iraq, to name a few. To make progress, we must rise above the partisanship and the issues that divide us to find common ground. We must move the country in a dramatically new direction. I strongly believe Barack Obama is best positioned to lead the nation in that new direction. The race for Senate endorsements will continue as eighteen Senators still have not made an endorsement. The endorsements to date are under the fold. Sen. Russ Feingold said today that he voted for Democratic presidential candidate Sen. Barack Obama in this week’s Wisconsin primary and indicated that he likely will vote for Obama’s nomination as one of the state’s “superdelegates” to the Democratic convention this summer.